This product is specially formulated to clean exterior surfaces containing mold, mildew, algae, and surface dirt, and leaves behind a protective shield that inhibits the re-growth of mildew and algae. Use for treating mold, mildew, and algae growth before staining. Clean, well-prepared surfaces give you the best results. The chart below will help you choose the right product for your project. Use PPG Stain Stripper to remove old coatings. Use PPG Deck Cleaner to restore the wood. Stain with your desired PPG Porter Paints® Acri-Shield® Exterior Stain. 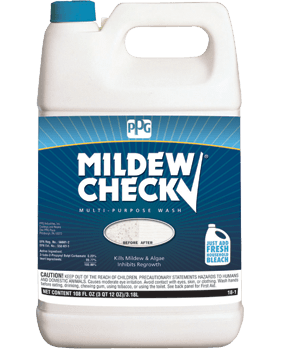 Use PPG Mildew Check to remove dirt and restore wood. 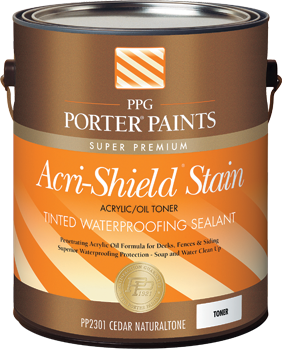 Stain with your desired PPG Porter Paints Acri-Shield Exterior Stain. Use PPG Deck Cleaner to remove dirt and restore wood. 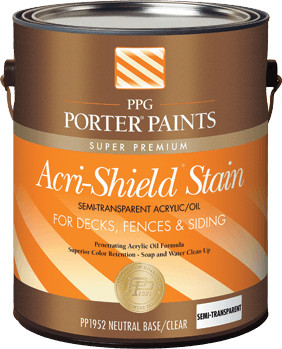 Stain with your desired PPG Porter Paints Acri-Shield Exterior Stain . Adds subtle color while allowing wood's natural grain and texture to show through in this unique penetrating acrylic/oil formula. Adds a hint of natural color to your wood while providing excellent waterproofing protection in a penetrating acrylic/oil formula.